Very rare find! Beautiful custom built concrete block home on 2.16 peaceful, quite acres overlooking over 100′ on Ocklawaha River & Greenway with beautiful sunsets, nature views with turkey and deer visiting almost daily. Cast a line from the floating dock or relax on one of the many dock levels. 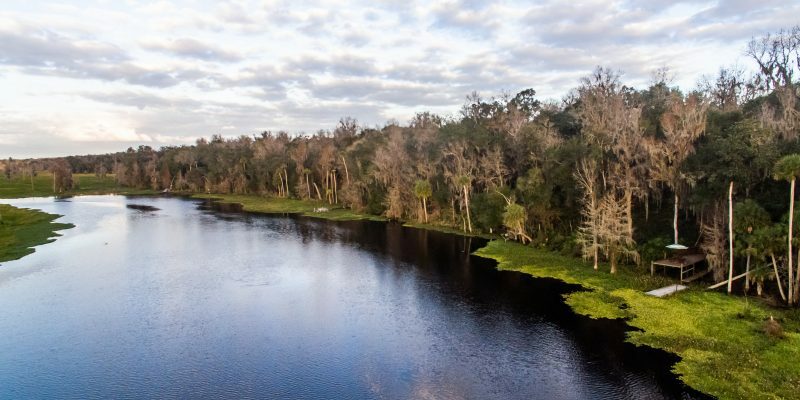 Take a short boat ride to the World Famous Rodman Reservoir known for the trophy Large Mouth Bass, 20 minute ride to locks leading to the St Johns River. Located in the heart of the Ocala National Forest known for hunting, trail riding, canoeing, kayaking, horseback riding or just relaxing. In fact, you can ride right from the property on your ATV/SxS and access 80+ miles of trails through the Forest. On those cold nights, relax in front the fire pit as you watch the sunset over the river. This custom built home is over 1820 living square feet with open floor plan and tile throughout. Inside you will find a cozy open floor plan soaring cathedral ceilings in living/dining area. The spacious kitchen including custom cabinets, granite countertops, recessed lighting, stacked stone island and all stainless steel appliances are included. Just off kitchen area is laundry room with large pantry, cabinets and countertops w sink. Living room with stack stoned wood burning fireplace, plant shelves, Infinity surround speakers and includes double french doors leading to porch w/ views of river. Main bedroom is 24 x 17 with vaulted ceiling, sitting area and bathroom with walk in sunken shower, privacy toilet, custom cabinetry and granite countertops. 2nd bedroom is 16×12 and includes nice size closet. 3rd bedroom is currently being used as Den/Study. Great to entertain on the 1,490 Sq Ft wrap around screen porch featuring hot tub with views of the woods and river. As you walk around to back of the home you will caged black pebble crete pool, outdoor shower, and plenty of room to grill and entertain. while enjoying the large from the great room area with double french doors and more views of the Ocklawaha River. Just beyond home and caged pool is a dream 30×50′ metal workshop w/ 8″ concrete slab floor, enclosed room, 110/220 power, water and double roll up doors. There is attached one bay parking for boat and another building that will hold ATV, mower and all the yard tools or toys you desire. This is… A TRUE ON OF A KIND JEM!!! CALL, TEXT or EMAIL TODAY FOR PRIVATE SHOWING!! !